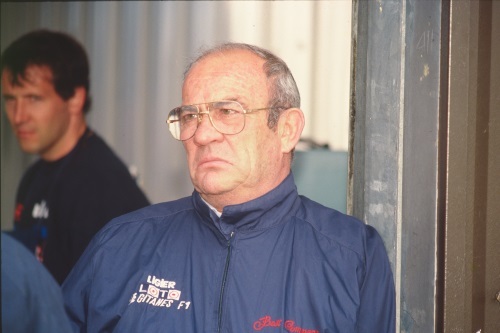 It is with great regret that we have to announce the death yesterday of one of France’s most prominent Formula 1 personalities of the last 50 years, Guy Ligier, who has passed away at the age of 85. Guy was elected an Honorary Member of the BRDC in 1967 at a time when he was a privateer in Formula 1, first with a Cooper-Maserati T81 and subsequently a Brabham-Repco BT20. A self-made man, whose first fortune came from a construction company which helped build France’s autoroute network, Guy represented his country at rugby union before taking up motor racing in 1963 with a Porsche. A year later he teamed up with Jo Schlesser at Ecurie Ford France for a mixture of international Formula 2 and sports car racing which continued through 1965. The advent of 3-litre Formula 1 in 1966 led to the acquisition of a Cooper-Maserati T81 and subsequently a Brabham-Repco BT20, Guy earning his only F1 World Championship point with the latter in the 1967 German Grand Prix by finishing eighth behind two F2 cars which were ineligible for points. Sharing with his great friend Jo Schlesser, Guy enjoyed rather more success in sports car racing with a 7-litre Ford GT40, winning the 1967 Reims 12 Hours and finishing fourth in the Mugello road race, and fifth in the Nurburgring 1000 Ks. After Jo Schlesser was killed in the 1968 French Grand Prix, Guy stopped driving for a while to concentrate on his sports car company, returning to racing at Le Mans in 1971 with the Cosworth DFV-powered JS3; all Ligier models would be given the ‘JS’ designation in honour of Jo Schlesser. Although a Ligier never won Le Mans, a DFV-powered JS2 driven by Jean-Louis Lafosse/Guy Chasseuil was second to the Gulf Mirage of Jacky Ickx/Derek Bell in 1975. By then Guy was turning his attention to Formula 1 with Jacques Laffite as his principal driver, using the assets of the disbanded Matra Sport team including the V12 engine. The first victory came in the 1977 Swedish Grand Prix with the Matra-powered JS7. For 1979 Jacques was joined by Patrick Depailler, and the Cosworth DFV-powered JS11 raised eyebrows by winning three of the first five races. Didier Pironi replaced Patrick Depailler for 1980 when Ligier finished second in the Constructors’ Championship behind the dominant Williams cars but well ahead of Renault! Working closely with French President Francois Mitterand, Guy Ligier played a major part in the re-construction of the Magny-Cours circuit as the home of the French Grand Prix and the Ligier factory but, seeing the writing was on the wall for Mitterand, Guy sold his company to Cyril de Rouvre who in due course moved it on to Alain Prost. Meanwhile Guy Ligier set up businesses producing fertilizers and tax exempt microcars. With his approval but without Guy’s direct involvement the name Ligier lives on with the sports-prototypes produced for the LMP3 category by Jacques Nicolet. The Club have not been made aware of any funeral arrangements but will update this release when they are known.